Simulates the passage of time when sleeping through the night by ticking entities and/or randomly ticking blocks proportional to the amount of time skipped. Also adds a command (/simulate) to simulate (and optionally set/add) time. This mod is specifically coded to work with Morpheus. It may or may not work with other mods that alter sleep. If allowed, and if the server is set to send command message lang keys to be translated on the client running the /simulate command (OPs only), clients without this mod will receive the raw lang keys, rather than the intended text. 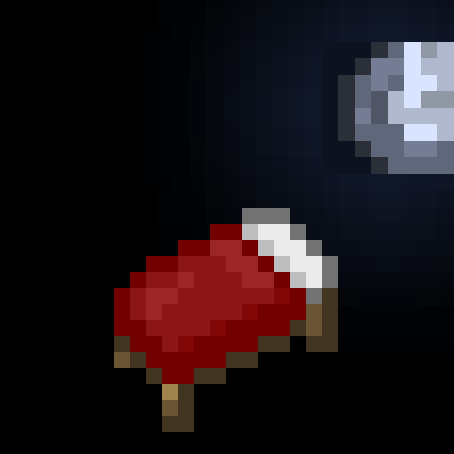 If allowed, and if 1) the night is set to simulate in a single server tick; 2) a sleep delay is used; and 3) the server is set to put players in a deep sleep; then clients without this mod will not be put in one. Since being in a deep sleep is what prevents players from leaving their beds during a sleep delay, players without this mod installed on their client will be able to leave and enter a will, while those with it installed will not be. I wake up, has passed several seasons, it's funny. It already is. Just set "Server Ticks Night is Simulated Over" to "Single" and "Sleep Delay" to 1. You might have to adjust "Simulated Ticks Per Server Tick" for the missing 200 'real' ticks, but it works just fine otherwise. If there's a working 1.12 version, why can't I add it with the launcher? It's because the version of the mod is meant for 1.12, and the twitch app doesn't show mods for 1.12 (if you are using pack with version 1.12.2), only those that have version for 1.12.2 aswell. You can add it manually from here though. I believe it does. I've just marked it as such. The mod looks awesome but I feel like this is gonna break some stuff in bigger modpacks. Is this just a feeling or am I right? it's gonna be laggy if you use lots of ticking tiles, but it simulates a vanilla function. the 1.12 version work ins minecraft 1.12.2? Can you add the option of choosing what time to sleep to? Like a mod from a while ago? Does this need to be installed on both Server and Client? Seems to do wacky stuff to Seasons in Tough As Nails. Not sure if there's a way to alter the settings to prevent this, but I went to sleep the first night (early spring) and ended up in fall! As I said in another comment: Just set "Server Ticks Night is Simulated Over" to "Single" and "Sleep Delay" to 1. You might have to adjust "Simulated Ticks Per Server Tick" for the missing 200 'real' ticks, but it works just fine otherwise. Check out somnia for the 1.7.10 equivalent. This reminds me of the beta sleep cycle when mobs could interrupt your sleep. Can this mod do this? BTW Great Job! Well, the beta behavior was to have a chance to spawn hostile mobs around beds while sleeping. This mod can optionally tick all entities when simulating the night (set by 'Tick All Entities Overnight'). If so mobs, will move very quickly, and if hostile ones happen to wander into range of the player, they will target and attack the player, which will wake them up. As this is more realistic, I personally prefer it to the beta behavior. Just note that this is set to false by default, due to the extra simulation time required.